Over 37 million people in the United States speak Spanish as their native language and more than 16 million have limited English proficiency. Functional health literacy influences a patient’s ability to read and understand labels on medicine containers, appointment slips, informed-consent documents, and medical instructions – all considered basic health documents that a patient encounters in healthcare settings. 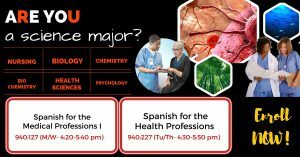 At Rutgers University–Camden, health professionals across disciplines can enroll in the following courses designed to prepare them to effectively communicate, treat, and serve Spanish-speaking persons in clinics, hospitals, nursing homes, and doctor’s offices. An introductory course that allows students to acquire a basic level of competency in Spanish language through the usage of lexicon and grammatical structures particularly relevant in a clinical environment. Participants will master such grammatical elements through contextualized discursive practice on the most common ailments and diseases such as diabetes and heart disease. Particular emphasis will be given to thematic elements such as pain scales, emergency responses, and treatment options. By the end of the semester, students will be able to effectively communicate with Spanish-speaking patients and co-workers on the themes and grounds stated above. An intermediate course geared toward students with prior knowledge of Spanish that are interested in improving the vocabulary range and communicative skills demanded in a clinical setting. Students taking this course will not only be able to recognize and discuss a patient’s health history, but also to establish in-depth conversations about a wide range of important topics in healthcare, such as preventive care, wellness, women’s health, and mental health, with a special focus on addiction. This course uses real life, medical materials from a wide range of clinical settings in order to explore how the particular history of the Spanish-speaking communities has played a pivotal role into the past and present medical needs of these groups. In reviewing the immigration patterns that from the 18th century on have favored the outpost of vibrant Hispanic communities in the Tri-State area, the class explores how the resulting medical and cultural idiosyncrasies of this population can be more effectively addressed by healthcare policies in order to produce true health equity in the region and the country. Page last updated by World Languages and Cultures at 10:57 pm October 15, 2018 . This page was printed from http://foreignlanguages.camden.rutgers.edu/spanish-for-the-health-professions/ at 12:39 AM Monday, April 22, 2019.